Created by S.S. Van Dine, Philo Vance was quite popular in books, movies and on radio. He was portrayed as a stylish, very intelligent and cultured private detective-an Americanized Sherlock Holmes-working out of New York. In the movies, William Powell, Warren William, Paul Lukas and Basil Rathbone starred as Vance. On radio, he was voiced by Jose' Ferrer, John Emery and Jackson Beck. Not that Vance needed any help solving a crime, he did work closely with his secretary and right hand woman, Ellen Deering and his pal John Markham, New York County District Attorney. 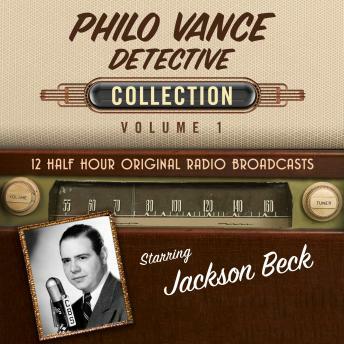 First heard for a brief time on NBC radio in 1945-46 it enjoyed success in syndication beginning in 1948 starring Jackson Beck.